Bucks Survivor: Year Four ~ The Bucky Channel - The World of Sports from Wisconsin's Perspective. Everyone's favorite elimination style Bucks game is back! It's Bucks Survivor! 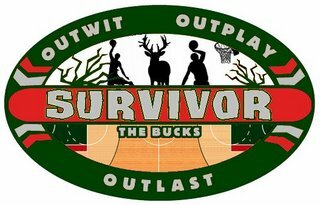 Bucks Survivor, of course, is the popular game where you have the opportunity to vote off a member of the Milwaukee Bucks week by week, and the last one standing is the Bucks Survivor. The goal is to find out who the one Buck would be that we want Milwaukee to build around for the future. Andrew Bogut was deemed the winner during our first attempt at this three years ago, he repeated the performance in year two, and last year Brandon Jennings took the nod. Who will reign supreme this year? I honestly don't know, because everyone kind of sucked. That will be left up to you (and me from as many computers possible in an effort to inflate the voting numbers). In the past, we've separated the team into tribes of young guys and veterans, and then I put them through "challenges" each week such as assists per game and how good/terrible their contracts are. Since the challenges we're semi-rigged anyway, I'm going to keep everyone in one tribe and leave it all up to fan voting. So each week we'll vote one Buck off the island and determine who the Bucks Survivor really is. Voting, as always, can be done at the poll on the right hand side of the blog. Enjoy.